Stephen Colbert has cancelled plans for The Late Show to visit New Zealand this week following last Friday’s terrorist attack that left 50 people dead. 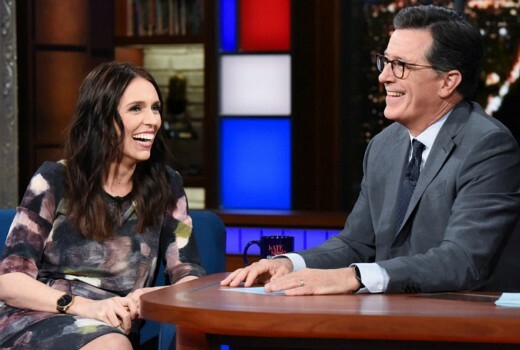 Plans to visit has been kept largely under wraps, but followed New Zealand prime minister Jacinda Ardern inviting him when she was a guest on the show in September. “I just love that country,” he said later. “If you’ve never been, go. The people there are unbelievably kind and welcoming. Obviously we’re not going to go down now but we hope to go down in the future and again, we want to say to everyone down there how sad and heartbroken we are for what that country is going through. For one of the hallmarks of New Zealand and one of the things I have always thought of, is it’s this wonderful, isolated country so far away from the problems we take for granted here north of the equator. Variety reports there are no new dates planned as yet. I hope its not too long before this happens, any change he will pop in for a visit here while in the part of the world? So very embarrassing that the perpetrator was Australian. I think we might well find that the reason he went to NZ to commit it was their very liberal gun laws in comparison to ours, especially given the number of gun killing events there over the decades-the events of last Friday are not unprecedented in NZ-the 2006 film ‘Out of the Blue’ starring Karl Urban that gets shown on SBS on occasion is worth seeing for this. Let’s hope the trip does eventuate at a more appropriate time. The tourism industry in NZ will need some help to bounce back from this. What a brilliantly classy response!